Liverpool FC was the first Premier League Club to sign the Armed Forces Covenant in 2014. 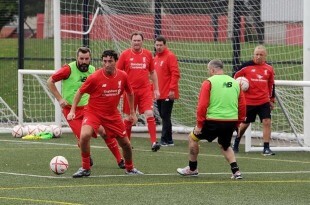 Steve Hollis leads the Military Veterans Football Programme, which is part of the Liverpool FC Foundation. Steve tells us how he and the Club believe that they are creating positive and sustainable changes to many Veterans lives. As a former full time player at Liverpool, and then a coach for 12 years at the LFC Academy, I was really enthusiastic when asked to be part of a new military veterans initiative that the club wanted to set up. Back in 2012, working alongside the Local Council and Clinical Commissioning Group, we developed the idea of using football as a way of encouraging veterans to take part in regular physical activity as well as promoting healthy life-style messages. The Barracks to Bootroom Programme was born. With a small group to start with, we accepted an invitation to play at Burnley FC as part of their Remembrance Day game and from that we quickly developed to having a weekly session each Sunday at the LFC Academy and taking part in 11 a side games. I soon began to recognise similarities between the group of veterans taking part and any football team, professional or otherwise. The sense of camaraderie and spirit of togetherness is very strong, with new participants quickly welcomed and made to feel part of the group. I hear tales of service from all over the world and feel l know many of the characters personally. New friendships have been formed and old ones renewed regardless of rank (to the great delight of some of the lads). I say “lads” as no female veterans have joined us yet – but we would encourage this and welcome the day this happens. The group has grown in diversity, with members from across the tri-services, and because of this, there is always some new song or military slang that needs to be explained to me. This is all part of the ever-present banter that signals the comradeship the group feels and the respect they have for each other, and for their shared experience, both in service and now on the football field. 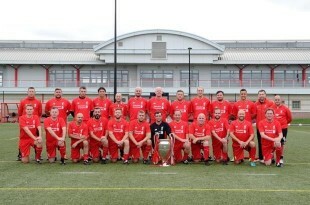 We are very lucky to have the LFC Academy as our regular training base and over the three and a half years many veterans from the group have undertaken their level 1 coaching badge and gone on to be employed as football coaches. We feel that this part of the programme empowers the individuals to add a new dimension to their life after they have transitioned to civilian life. The veterans are keen to give something back to the local community and get involved in other activities that the LFC Foundation arrange, including Match day bucket collections and the “Run for the 96” memorial event. Some of the younger veterans have volunteered for the Premier League Kick sessions that aim to engage with 14 to 24 year olds from areas of high disadvantage. We are tremendously proud of the programme, which has also seen us have trips away to RAF Lakenheath and HMS Tremeriare and working with veterans in custody. I very much hope that we can continue to grow with many more veterans benefitting as a result. We would really like to engage more with female veterans and those who are WIS (wounded injured or sick) and believe that we can create positive and sustainable changes to many veterans’ lives. If you are a veteran, reservist or within 1 year of leaving service and would like to get involved in the programme please contact steve.hollis@liverpoolfc.com.